The Preakness it isn’t. In fact, Bermuda lobster racing may rate somewhere on the excitement scale just below waiting for the sheriff’s department to close down the Sunday afternoon pony cart races in Eureka, Kansas. But whatever the racing of Panulirus argus is, or isn’t, Bermuda has had its first Invitational Lobster Race and has selected an entry in the Fourth Annual All-Service Lobster Land Race in Newport Rhode Island. Lobster racing is a gentleman’s sport and it goes without saying that the highest plateau of good sportsmanship will be displayed by all contestants. Each lobster entered must be obtained by a member of the sponsoring group and must have been taken only by those methods acceptable under Bermuda fishing laws. (Ed. note: the word “obtained” in this rule does not preclude the slipping of a $5 note to the sponsoring group’s favorite commercial fisherman. Lobsters must be at least of minimum size authorized to be taken from Bermuda waters. Each entry must be accompanied by a certified jockey familiar with lobster racing and suitably attired. No stimulants (pep pills, etc.) may be given to the lobsters prior to the race. The contestants will be examined before the race to ensure they are physically fit. In the inaugural meet of the N.A.S. 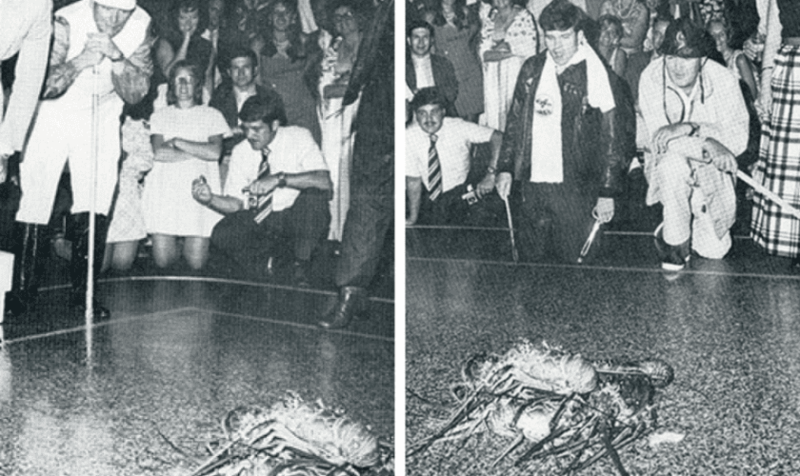 Officer’s Club, the lobsters placed under a bushel basket in the centre of a square marked on the club floor with masking tape. The galloping lobsters had five minutes to break the tape after which the jockeys could start “prodding” their mounts. The winner of the island chain’s first race, held in October, was a two-pounder named “Sonofalobster” by its owners the Golden Pelican Farms, a pseudonym for VP-44, a U.S. Navy anti-submarine squadron on exercises in these waters. Sonofalobster was transported to Newport by Miss Janet Ellis, a 20-year-old London-born secretary at the NASA (Bermuda) tracking station. In keeping with the blistering pace of lobster racing, the results of the Newport event have yet to filter back to Bermuda. Miss Ellis, whose own entry, a seven pound giant named “Speedy Crustacean” fell asleep at the starting line, was named the best jockey of the evening which carried with it the right to carry the colours of Panulirus argus to Newport. The Newport event assumed a truly international flavour with the introduction of the clawless spiny lobster to a competition previously dominated by the clawed American or northern lobster, Hamarus americanus. The favorite lobster before the race at the Naval Air Station seemed to be a lobster named “Daniel Canuck”, the entry of the Canadian Armed Forces base at Daniel’s Head, Somerset. Shortly before race time, it was discovered that Daniel was a filly. Mrs. Barbara Graham, Daniel’s trainer, also brought the lobster’s length down to 14 inches by daily training runs from Somerset to Hamilton. When the bushel basket was lifted from the starting gate and the lobsters urged toward the finish line by their jockeys, Daniel failed to move. She seemed attracted to a rakish South Shore lobster with one antenna missing, entered by the U.S. Naval Research Laboratory in Southampton and named “Nautilus Rex”. “I guess there’s such a thing as overtraining,” a dejected Capt. Graham said after the race. Trainers of Swifty Crustacean, the NASA tracking station’s entry, said their lobster had been confused by the course layout. Swifty had been confused by the course layout. Swifty had been trained on a circular course (known in lobster racing circles as lobster racing circles) and was confused by the Naval Authorities laying out a square course. Other entries in the First Bermuda International Lobster Race included the Royal Navy detachment at H.M.S. Malabar, whose entry died on the way to the track; VP-415, a Canadian anti-submarine squadron; the Bermuda Police Force, represented by none other than Commissioner L.M. (“Nobby”) Clark, a former Canadian lobsterman himself; the Department of Defense teachers at the Naval Air Station; and the station’s U.S. Marine Detachment. Andy Murphy, manager of the station’s Officers’ Club, said the event may be opened up to all segments of Bermuda next year in preparation for the Fifth All-Service Lobster Land Race in Newport.